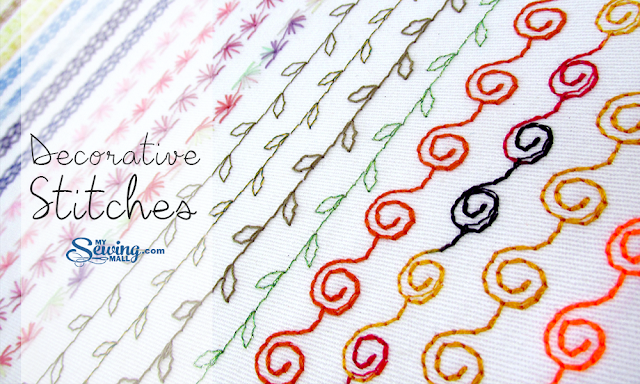 Decorative stitches can really can take your project from plain to POW! Most sewing machines come with a variety of decorative stitches that we rarely use! Let’s make today different. Pick one simple project that you can enhance with a decorative sewing detail. 1. Take your time and stitch slowly. 2. Make a sampler! This is super important and will give you an instant visual on your stitch types. They really look so different from that small image on your machine when stitched out. 3. Use a lighter weight thread in your bobbin. This is prevent a bird’s nest of thread in the bobbin area and prevent the bobbin thread from being visible on the top side of your project. If both sides of your seam will be exposed be sure to use embroidery thread in your bobbin. 4. Use the correct presser foot. Most embroidery stitches require the Monogram foot. Remember this foot has the carved out channel in the back for thicker stitches. 5. To avoid skipped stitches, use a ball point needle. note this needle is also used on knit fabrics. Mark a few guidelines with a heat erasing pen. This simple disappearing line will be your friend on a long stitch line. 6. Test your back-stitch or reverse button before stitching directly on your project. On some stitches, pushing this button means locking in the stitch while on others, it can interrupt the stitch. So, it is best to just double-check. 7. Consider your thread options. There is a whole wide world of choices out there. Some of my favorites include metallics and variegated. I just love the shine the rayon offers! 8. If you are not happy with your stitch coverage, consider sewing with two threads. Just wind a bobbin up with your top stitching thread and thread your machine like normal. This double thread will provide a nice compact stitch and amp up the “POW” factor! 9. If needed, consider using a tear away or iron on stabilizer under your fabric to provide additional support or add a quick spritz of starch to give some extra body. 10. Play with your stitch lengths and widths. You will be surprised at the different outlooks you can achieve with just a few simple adjustments. Heck- dig out your double needle and watch the magic happen! 11. Overall, my suggestion is to test everything! My machines have a ton of different stitches and the manual pictures do not do them justice!